When the Pentagon was hit, more than 50 minutes after the attacks began, Keane initially spent time helping people get out of the building--a task that anyone could have performed--instead of carrying out his duties as head of the Army. He only went to the AOC, a facility that was ideally equipped for dealing with the crisis, when one of his staffers pointed out that he should "leave the recovery to other people" and go and "take command of the Army." We need to consider why Keane, despite being an experienced military man, apparently performed very poorly in response to the crisis on September 11. Was his inaction due to incompetence or was there a more sinister reason for it? Might he have been confused because he mistook actual events for simulations, as part of a training exercise? Might he even have been to some degree complicit in what happened and so his inaction was intended to help ensure that the military was unable to stop the attacks before the targets were hit? Keane was one of a number of key officials who surely had essential duties to perform in coordinating the military's response to the 9/11 attacks but failed to get properly involved in responding to the crisis until it was too late to make a difference to the outcome of the attacks. His actions on September 11, though, have so far avoided serious scrutiny. We therefore need to examine what he did, and what he failed to do, while the attacks were underway. 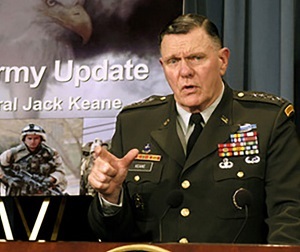 Jack Keane was vice chief of staff of the U.S. Army--the Army's second-highest-ranking officer--from 1999 to 2003. On September 11, however, General Eric Shinseki, chief of staff of the U.S. Army, was out of the country attending the Pacific Armies Management Seminar, a conference in Kuala Lumpur, Malaysia. This meant Keane was the highest-ranking Army officer in the U.S. that day and presumably served as the acting chief of staff of the Army while Shinseki was away. He would therefore likely have been responsible for taking charge of the Army's response to the terrorist attacks in New York and at the Pentagon, and his actions would surely have had a significant impact on how effectively the Army performed. The Army in fact had a unique and important role to play on September 11. As "executive agent" for the Department of Defense, it was responsible for coordinating with the Navy and the Air Force on "proposed action to support civilian authorities during emergencies involving mass casualties," according to the Defense Department's book about the Pentagon attack. It was presumably, therefore, particularly important that Keane acted promptly and effectively in response to the attacks. Keane was at the Pentagon--the headquarters of the Department of Defense--on the morning of September 11. This was probably an ideal location from which to respond to the 9/11 attacks. And yet descriptions of his actions indicate that his reaction to the crisis was far less adequate than we might reasonably expect. He was in his office when the attacks began and was promptly alerted to the first crash at the World Trade Center. American Airlines Flight 11 flew into the North Tower at 8:46 a.m. and CNN started reporting the incident at 8:49 a.m. Apparently very shortly after this, a member of his staff ran into the room and said, "Sir, something terrible is going on in New York." She turned on the television and Keane then saw the reports stating that a plane had hit the Trade Center. Keane has recalled that, unlike many people, he realized right away that the incident was a terrorist attack. Noticing that it was a cloudless day, he thought, "Nobody could ever hit the World Trade Center on a day like that by accident." He also remembered that the Trade Center had been the target of a terrorist attack before, with a bomb going off in the underground parking garage there in February 1993. Therefore, he has commented, "I knew instinctively it had to be a terrorist attack and said as much." The AOC was "the Army's command and control center," Chiarelli has commented. And yet, while Chiarelli headed to it after Keane called him, Keane remained in his office at that time. Even after he saw the second hijacked plane--United Airlines Flight 175--crashing into the World Trade Center on television, at 9:03 a.m., he stayed where he was. At some point after the second attack in New York occurred but before 9:37 a.m., when the Pentagon was hit, Chiarelli called Keane from the AOC. He reported that the Operations Center was fully manned and alerted Keane to a suspicious aircraft that had been noticed flying toward Washington, DC. He said he was monitoring Federal Aviation Administration communications and, Keane recalled, had learned that "a plane that took off from Washington, DC, had turned around in the vicinity of Ohio and approached DC from the south along I-95 before turning east, short of the city, and then south again." (He was presumably referring to American Airlines Flight 77, the plane that supposedly crashed into the Pentagon.) "We were obviously aware then that there was a plane targeting Washington," Keane has commented. Keane and Chiarelli started discussing the procedures for evacuating buildings in the capital. But then the Pentagon was hit. Keane felt his office shake violently, even though it was located far from the crash site, and, he recalled, the office "immediately" began to fill with smoke. He alerted Chiarelli to the incident right away. "Pete, that plane [that was approaching Washington] just hit us," he said. Even then, however, Keane apparently issued no orders or did anything else to help protect America and prevent further attacks. Instead, he recalled, he told Chiarelli "to tell the U.S. Army around the world what happened [at the Pentagon] and that, given the status of the AOC, which was unharmed, we would still maintain command and control of the Army." Keane told his staffers to evacuate at that time. But he stayed inside the Pentagon himself, keeping just his executive officer and his aide with him. However, rather than heading to the AOC, where he could have helped the Army respond to the crisis, he went toward the scene of the attack. "Let's go on down there and see if we can help some of these people," he told his aide and his executive officer. The three men made it to about 100 yards from the crash site, where they found the smoke becoming thicker. From there, they helped Pentagon employees get out of the building--"making sure they know what to do and where they're going, and that sort of thing," Keane described. Analysis of Jack Keane's actions highlights numerous oddities around how the Army vice chief of staff reacted to the 9/11 attacks, which we need to examine. An important question to consider is why Keane remained in his office after he learned of the first crash, even though he would surely have been much better able to organize a response to the crisis in the Army Operations Center. Keane recognized immediately that an attack was underway when he learned that a plane had hit the World Trade Center. "I sensed it instinctively what had happened, that this was a terrorist act," he recalled. He should presumably, therefore, have realized that he needed to respond quickly and effectively, in case more attacks were imminent--as indeed turned out to be the case. And since the Army was the Department of Defense's "executive agent" for providing support to civilian authorities during disasters involving mass casualties--like the one that had just occurred in New York--he should presumably have gone immediately to the most suitable location for organizing Army assistance in response to the crash. The facility was equipped with state-of-the-art communications equipment and television sets for monitoring news coverage. It also had four giant screens on the wall on which personnel were "monitoring all the activities that took place that day," Keane described. And there was a "watch team" there that monitored the world constantly. Keane surely needed to closely follow what was happening after he learned of the first crash, so he could immediately deal with the crisis and promptly respond to any additional emergencies if they arose. In the AOC, he would have had the resources necessary to do this. But, by staying in his office, he limited his capabilities. With such invaluable resources available at the facility, Keane would have been ideally positioned in the AOC to communicate with other senior officials and help them organize a response to the terrorist attacks. And yet, even when the Pentagon was hit, more than 50 minutes after the first attack took place, he did not initially go there. Instead, at that time, he headed toward the crash site, intending to assist people there. Along with his executive officer and his aide, he then spent time making sure that people were able to get out of the Pentagon. This course of action was inexplicable. There would have been plenty of people at the Pentagon who could have helped personnel find their way out of the building and so it was unnecessary for a top official like Keane to get involved with the task. But as the most senior Army officer in the country that day, Keane was irreplaceable and there were presumably specific duties he was required to carry out. While he was busy helping people evacuate, he would have been unable to carry out these duties. Once he reached the Operations Center, Keane provided "leadership and guidance" to the personnel there, according to a report published by the Army. But surely he should have provided leadership and guidance from the outset, by going to the AOC immediately after he learned of the first crash. Keane's decision to stay in his office after he heard about the first crash and determined immediately that it was a terrorist attack is also puzzling because Keane should surely have realized that, if America was under attack, the Pentagon was a likely target. Keane should surely have assumed from the outset that the Pentagon might be attacked. He should therefore have made his own safety a priority, so he would still be able to carry out his duties if it was hit. Keane stayed in his office after he saw the second plane crashing into the World Trade Center on television, even though it became clear then that the crisis involved more than an attack on just a single target. The possibility of the Pentagon being hit--and the need to go to a safer location--should have seemed increasingly great to him at that point. Keane's decision to stay in his office until after the Pentagon attack occurred is particularly astonishing considering that when Chiarelli called, before the Pentagon was hit, he told Keane a suspicious aircraft had been noticed flying toward Washington. Keane even seems to have thought at the time that this aircraft might be heading toward the Pentagon. He recalled that he and Chiarelli were "concluding it's heading for a building someplace in Washington," and he asked Chiarelli: "What's the plan to evacuate this building [i.e. the Pentagon]? Why isn't it being evacuated?" It is remarkable too that, in light of the possibility of the Pentagon being attacked, Keane made no attempt to send his staff to somewhere more secure. Surely, just as he should have ensured his own safety, he should have taken action to ensure the safety of his staffers. And yet he did nothing before the Pentagon was hit. After the Pentagon attack occurred, almost all Army personnel at the Pentagon evacuated the building. Only at that time did Keane order his staffers, "Call your homes right now and make sure everybody knows you're alright, and then I want you to all to leave the building immediately." By then, however, it was too late. If the area of the Pentagon in which they worked had been hit, members of Keane's staff could have been killed or seriously injured. An aspect of Jack Keane's behavior on September 11 that may be particularly significant was Keane's apparent failure to activate the Army's Crisis Action Team at the Pentagon. Keane, as the most senior Army officer in the U.S., should presumably have arranged for it to be activated as soon as possible on the morning of September 11, so the team could promptly respond to the attacks. He could perhaps have ordered Peter Chiarelli--who oversaw operations in the AOC--to activate it when he called him after he learned of the first crash. And yet the only action he took at that time, according to his own recollections, was to order Chiarelli to bring the AOC up to full manning. Chiarelli, according to his own recollections, started watching the coverage of the first crash at the World Trade Center at around 9:00 a.m. on September 11 on the television in his office, where he had been preparing to go to a meeting. Although he has said it was "unclear" to him at that point whether the crash was "a terrorist action," he realized that the incident was "a really serious situation." He therefore called Lieutenant Colonel Kevin Stramara--his chief of operations, who was responsible for the CAT--into his office. Keane, evidence suggests, failed to take any significant action in response to the 9/11 attacks while they were taking place. However, as a result of certain anomalous circumstances, he had a lot of power in the crucial hours after the attacks. The chief of staff of the U.S. Army in 2001 was Eric Shinseki. However, as previously noted, Shinseki was in Malaysia on September 11, for a conference of the chiefs of staff of Pacific nation armies. He was promptly alerted to the news that a plane had crashed into the World Trade Center and, when he then saw the second crash live on television, realized it was a terrorist attack. But since he was on the other side of the world to where the attacks occurred, he was only able to participate in the military's response to the crisis over the phone. Most of the senior U.S. Army delegation in Malaysia prepared to head immediately back to America. However, on top of the long time it would take to fly to the United States, their journey was delayed because U.S. airspace was closed in response to the attacks. Shinseki appears to have therefore only arrived in Washington, where he could resume his duties as Army chief of staff, on the night of September 12. While he was away, Keane, as his second in charge, would presumably have carried out these duties. Another key official whose circumstances led to Keane having increased power in the hours following the attacks was Thomas White. As secretary of the Army, White was the top civilian leader for the U.S. Army, and was responsible for the effective and efficient functioning of the Army. He was also the "top executive agent in the Pentagon hierarchy," the "coordinator of continuity for the Pentagon," and the "middleman for military support to civil authorities," according to military expert and author William Arkin. However, due to an apparent mishap, he was away from Washington for several hours on September 11. However, after he spent some time in the Operations Center, he was ordered to go to Raven Rock, a secure complex of buildings outside Washington. He objected to being sent away from the Pentagon. But the officer in charge of the relocation and continuity of operations plan had explained to Peter Chiarelli--the man who told White he had to go: "[White] has no choice at this time. This has been directed and he must immediately proceed to leave here." When Chiarelli asked the officer if he was certain of this, he replied, "Yes, I'm sure." While Keane's apparent lack of response to the 9/11 attacks may seem alarming, the Army vice chief of staff was in fact one of several key officials responsible for running the U.S. military whose actions meant they were unable to carry out their duties while the attacks were taking place. Since Jack Keane, as the most senior Army officer in the country, was such a key figure in the U.S. military on September 11, it is alarming to find, upon close scrutiny, that his behavior while the terrorist attacks took place that day appears so suspicious. He seems to have done remarkably little to protect his country at a time when he should surely have assumed that his prompt action might help make the difference between further attacks succeeding or being stopped. Important questions therefore need to be addressed. We need to know, for example, what exactly Keane's responsibilities were on September 11. What actions should Keane have taken in response to the attacks? And, in light of his responsibilities, what exactly did he do and what duties did he fail to carry out? We need to know what orders Keane issued while the attacks were underway. The only ones we know of, based on his recollections, were that the Army Operations Center be brought up to full manning and, after the Pentagon was hit, that his immediate staff should evacuate the building. Were these the only orders he gave? More specifically, why did Keane apparently fail to order Peter Chiarelli to activate the Crisis Action Team and instead just tell him to bring the AOC--where the members of the CAT would assemble in an emergency--up to full manning? As acting chief of staff of the Army, activating the CAT may have been one of his responsibilities that day. And yet it appears that, after Keane called him following the first crash, Chiarelli arranged to have the CAT activated on his own initiative, rather than based on an order from his superior. Eric Shinseki--the actual Army chief of staff in September 2001--has indicated that he understood the importance of activating the CAT. Even though he was out of the country when the attacks occurred, after he saw the second crash on television, he recalled, he "gave instructions for the Army staff to stand up the Crisis Action Team." If Shinseki recognized the need to promptly activate the CAT, why was Keane apparently unable to do so? Another issue to address regards the lack of available information about Keane's actions in the half-hour or so after the second crash at the World Trade Center occurred. Keane has described calling Chiarelli after he learned of the first crash and then seeing the second crash on television. That crash took place at 9:03 a.m., almost 35 minutes before the Pentagon was attacked. The next thing Keane has described doing is talking to Chiarelli again, when the officer called to let him know the AOC was fully manned and a suspicious aircraft had been noticed flying toward Washington. That call, though, appears to have begun shortly before the Pentagon was hit, since the two men were still talking to each other when the Pentagon attack occurred. Keane's recollections, therefore, appear to leave about half an hour unaccounted for. What, then, did Keane do during this critical period, immediately after the second attack took place? We also need to consider why Keane was apparently so unconcerned for his safety and for the safety of his staff after he learned of the first crash, considering that he immediately realized the incident was a terrorist attack. Surely, as previously mentioned, if the U.S. was under attack, the Pentagon--as a prominent symbol of American power--should have been considered a likely target. And, located on the third floor of the outer ring, Keane's office was presumably in one of the most exposed and vulnerable areas of the building. We need to know if there was a particular person who was responsible for Keane's safety. If there was, who was this individual? Surely, such a person should have made sure that Keane was promptly taken from his office to somewhere more secure in response to the attacks on the World Trade Center. Why, then, did they fail to do so? DID KEANE HELP PLAN THE ATTACKS? What was the reason for Jack Keane's inaction while the 9/11 attacks were underway, when Keane should have been going out of his way to help the military respond to the crisis? Was Keane's poor performance simply due to incompetence or is there a more disturbing explanation for it? For example, might Keane have been confused because he thought information he received about the attacks was simulated, as part of a training exercise? Chiarelli has recalled that, on September 11, the Army was preparing an exercise for the CAT, which would be based around the scenario of a plane crashing into the World Trade Center. Although this exercise was scheduled to take place in the week after 9/11, it was a "no-notice exercise," which means its participants were not told beforehand exactly when it would occur. Army personnel, including Keane, might therefore have mistakenly thought the exercise was taking place on September 11 when they learned a plane had crashed into the World Trade Center that day. Another possibility, which, though unsettling, needs to be considered is that Keane was in some way complicit in planning and carrying out the attacks. His failure to take effective action on the morning of September 11 might plausibly have been because he intended to help ensure that the attacks succeeded and the military was unable to intervene before the targets were hit. If this was the case, it would mean a group other than al-Qaeda was behind 9/11. Instead, the attacks might have been perpetrated by rogue individuals in the U.S. military and other government agencies. If Keane was involved in planning the attacks, he would presumably have known which part of the Pentagon would be hit and he would therefore have known that, along with his colleagues, he would be safe in his office on the morning of September 11. If he had such foreknowledge, this fact could explain why he was apparently so unconcerned for his own safety before the Pentagon attack took place. Keane was an important and powerful figure on September 11. And yet little has been revealed about what he did when the 9/11 attacks occurred and his behavior that day has avoided serious examination. He is therefore one of a number of senior military and government officials whose responses to the attacks ought to be the subject of particular scrutiny in a new investigation of 9/11. "Army Officers Hold Meeting." Honolulu Advertiser, September 10, 2001; Christopher N. Koontz, Department of the Army Historical Summary, Fiscal Year 2001. Washington, DC: Center of Military History, United States Army, 2011, p. 55; Lindsey M. Elder, "Former CSA Reflections on 9/11 Attacks." U.S. Army, September 10, 2016. Keane has not explicitly stated that he was the acting chief of staff of the Army on September 11. However, evidence indicates that because Shinseki was out of the country, he would have performed this role. Specifically, General Richard Myers, vice chairman of the Joint Chiefs of Staff at the time, has explained how, because General Henry Shelton, the chairman of the Joint Chiefs of Staff, was away from the country on the morning of September 11, he was the acting chairman of the Joint Chiefs of Staff when the 9/11 attacks occurred. "Shelton was airborne on his way to Europe for a NATO meeting and couldn't be back for hours," Myers wrote. Therefore, he continued, "By law, as vice chairman, I was designated acting chairman of the Joint Chiefs during his absence." Presumably, Shinseki's absence on September 11 similarly meant Keane was designated, by law, as the acting chief of staff of the Army that day. See Richard Myers with Malcolm McConnell, Eyes on the Horizon: Serving on the Front Lines of National Security. New York: Threshold Editions, 2009, p. 10. Alfred Goldberg et al., Pentagon 9/11. Washington, DC: Historical Office, Office of the Secretary of Defense, 2007, p. 134. See also Department of Defense Directive 3025.1: Military Support to Civil Authorities (MSCA). Washington, DC: Department of Defense, January 15, 1993. Jack Keane, "My 9/11: A Personal Reflection by General Jack Keane, Former Vice Chief of Staff of the U.S. Army." Fordham Magazine, September 10, 2016; Jim Swift, "Gen. Jack Keane Remembers 9/11." Weekly Standard, September 11, 2016; "Mike Siegel 9-11-16." Mike Siegel Show, WRKO, September 11, 2016. Mike Williams, "Call Saved Rice Professor on 9/11." Rice News, September 9, 2011. Jack Keane, "My 9/11"; Jim Swift, "Gen. Jack Keane Remembers 9/11"; "Mike Siegel 9-11-16." Robert Rossow III, Uncommon Strength: The Story of the U.S. Army Office of the Deputy Chief of Staff for Personnel During the Attack on the Pentagon, 11 September 2001. Washington, DC: Department of the Army, Office of the Deputy Chief of Staff, 2003, p. 67. Robert A. Cohn, "Remembering the 'First Yahrzeit' of 9/11." St. Louis Jewish Light, September 18, 2013. Pete Chiarelli, interview by Frank Shirer. U.S. Army Center of Military History, February 5, 2002; Christopher N. Koontz, Department of the Army Historical Summary, Fiscal Year 2001, p. 56. Robert A. Cohn, "Cohnipedia: 9/11's Tenth Yahrtzeit." St. Louis Jewish Light, September 8, 2011. Mike Williams, "Call Saved Rice Professor on 9/11." Jack Keane, "My 9/11"; Jim Swift, "Gen. Jack Keane Remembers 9/11." Jim Swift, "Gen. Jack Keane Remembers 9/11." Steve Vogel, "Crew in Pentagon Bunker is Army's Eyes and Ears: Watch Covers all From Crises to Baby-Sitting." Washington Post, October 14, 1995; Pete Chiarelli, interview by Frank Shirer; "Gen. Jack Keane Describes Being in the Pentagon on 9/11." Fox News, September 11, 2016. William Schwab and Lorie Jewell, "The Army's Nerve Center." Christopher N. Koontz, Department of the Army Historical Summary, Fiscal Year 2001, p. 56. William Toti, interview by Mike McDaniel. U.S. Naval Historical Center, October 10, 2001. Pete Chiarelli, interview by Frank Shirer. Bob Woodward, State of Denial: Bush at War, Part III. New York: Simon & Schuster, 2006, p. 141. Steve Vogel, "Crew in Pentagon Bunker is Army's Eyes and Ears"; "Mike Siegel 9-11-16." Pete Chiarelli, interview by Frank Shirer; Robert Rossow III, Uncommon Strength, p. 65. Christopher N. Koontz, Department of the Army Historical Summary, Fiscal Year 2001, p. 55. Richard Halloran, My Name is ... Shinseki ... and I am a Soldier. Honolulu, HI: Hawaii Army Museum Society, 2004, p. 51; Lindsey M. Elder, "Former CSA Reflections on 9/11 Attacks." General Orders No. 3: Assignment of Functions and Responsibilities Within Headquarters, Department of the Army. Washington, DC: Headquarters, Department of the Army, July 9, 2002. William M. Arkin, American Coup: How a Terrified Government is Destroying the Constitution. New York: Little, Brown and Company, 2013, p. 176. Pete Chiarelli, interview by Frank Shirer; Thomas White, interview by PBS, Rumsfeld's War. PBS, August 12, 2004; Alfred Goldberg et al., Pentagon 9/11, p. 135. Alfred Goldberg et al., Pentagon 9/11, p. 135; William M. Arkin, American Coup, p. 176. William M. Arkin, American Coup, p. 176. "The Repeatedly Delayed Responses of the Pentagon Command Center on 9/11." Shoestring 9/11, November 7, 2010; "Profile: Montague Winfield." History Commons, n.d.
 "The Actions and Inactions of the Commander in Charge of the U.S. Air Defense Failure on 9/11." Shoestring 9/11, June 18, 2010; "Profile: Ralph Eberhart." History Commons, n.d.
 Lindsey M. Elder, "Former CSA Reflections on 9/11 Attacks." Stephen J. Lofgren (Editor), Then Came the Fire: Personal Accounts From the Pentagon, 11 September 2001. Washington, DC: Center of Military History, United States Army, 2011, pp. 95-97; "Army Command Center at the Pentagon Planned to Hold Exercise in Week After 9/11 Based on a Plane Hitting the WTC." Shoestring 9/11, March 26, 2011. Keane and Rumsfeld, despite their key positions, both failed to do anything meaningful in response to the attacks on the World Trade Center on September 11. And after the Pentagon was hit, both of them headed toward the crash site to help out there, instead of carrying out their duties and helping the military respond to the attacks. Very curious! Shoestring on Tue, 12/05/2017 - 10:23am. Keane gets a mention in this Intercept article, profiting, like many others, from the War on Terror. If any of you guys get bored, spend a couple of days (or longer) digging into the career of senior neocon strategist Fred Ikle, with reference to the publications he took part in, and the folks he worked alongside. Ikle's first book, THE SOCIAL IMPACT OF BOMB DESTRUCTION, looks at how societies can change through the effects of a massive violent event. Ikle was later a senior figure to Perle, Wolfowitz, and Zakheim, and took part in a late 1979 conference (in the US) with Rumsfeld's personal assistant during the Ford administration, Kenneth Adelman. (Adelman was later a member of PNAC, and himself eventually co-write a book with Lockheed Martin head Norm Augustine). The 1979 conference featured many Team B / Committee on the Present Danger folk, and is discussed in the volume that was issued right after it, NATIONAL SECURITY IN THE 1980s - FROM WEAKNESS TO STRENGTH. Ikle gets a major chapter in that volume, transcribing his talk from the event, and he argues for the imminent importance of an increase in the USA's weapons capability, noting that massive new expenditures were required. On that note, Ikle declared that a national effort to dramatically increase the defence budget seemed exceedingly unlikely "short of a dramatic external event" to change the views of congress and the public. His comments in 1979 were a precursor to the Pearl Harbor arguments in the REBUILDING AMERICA'S DEFENCES document. In the late 80's, Ikle contributed an ominous chapter to a book on psychological warfare, published by a right-wing think tank. He argued that psychological warfare against the public was valid if it contributed to important national security goals. The book is linked in PDF form below. Ikle's piece is at the beginning. At the end of 1997, Ikle joined Zelikow's Harvard study group on Catastrophic Terrorism. Through the same period (running into 1998) he also absented himself from that group for a day to meet up with Rumsfeld, who was in the thick of his own planning and activities through '97 and '98 - Ikle incongruously popped up on the interview listings for Rumsfeld's Missile Commission, on a day when Rumsfeld was meeting with air force personnel. After the Iraq War, Ikle may have had a change of heart. His final volume, ANNIHILATION FROM WITHIN, is a non fiction work warning that unscrupulous political figures might expand dictatorial powers to the point of fascism following a massive event of catastrophic terrorism towards the US, and so the real enemies we should watch out for are within our own borders. Bogan the Wanderer on Fri, 12/08/2017 - 6:32am. Thanks for the information, Bogan. I was interested to see that the Intercept article mentions General Wesley Clark as someone who has endorsed the NSA's mass surveillance. Clark was one of the first people to publicly declare, on September 11, that Osama bin Laden and al-Qaeda were behind the terrorist attacks, despite lacking a shred of proof that this was the case. Shoestring on Fri, 12/08/2017 - 10:46am.